If you're shopping for incredible power and performance, the 2017 Nissan Titan should be at the top of your list. Its class-exclusive 5.0-liter turbodiesel V8 engine generates 310 horsepower and 555 pound-feet of torque. This engine is paired with a six-speed automatic that does an excellent job of finding the exact right gear for the job at hand, creating a smooth, responsive ride. You can also add four-wheel drive into the mix to increase traction as you make your way through unpaved job sites or play in deep sand or deeper mud. Properly equipped, the Titan can tow max loads of 12,300 pounds - that's quite a few stacks of lumber or a nice sized boat. If you want an off-road-ready pickup, check out the 2017 Nissan Titan Pro-4X. It's up for action of all kinds, with a range of hardware designed to make the most of rugged trails, including four-wheel drive. Bilstein shocks contribute to its dominating performance, cushioning the Titan Pro-4X as you move through mountainous territory. This model also sports a lockable rear differential for optimal precision as you move through seriously rugged terrain. Skid plates and a spray-in bedliner enhance the Titan's durability, so it can take anything you can throw at it (or in it!). 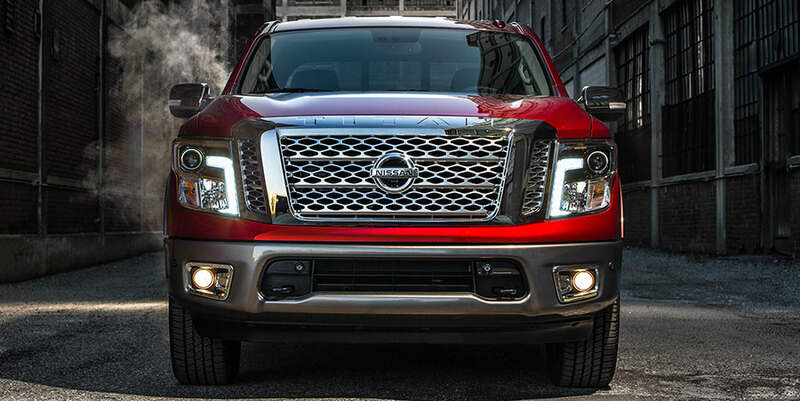 The 2017 Nissan Titan is also in rare form when it comes to technology. The central NissanConnect system is intuitive and easy to use, and it connects to your smartphone so you can stream your favorite Pandora stations. Voice controls are quick to respond to your requests, so interacting with the infotainment system without looking away from the road - or the off-road - is no problem. Other modern conveniences, like keyless entry and ignition, make it easy to get through your day. The Titan's dual-zone automatic climate control is the perfect solution when driver and front passenger can't agree on a suitable temperature which is, let's admit it, quite often. Finally, the Titan is surprisingly luxurious. It was certainly designed to tow and haul heavy loads and move through rugged territory like a beast. On the inside, however, the Titan can be as opulent as you wish. The crew cabin offers plenty of room for your crew, family or otherwise. With premium leather upholstery options, the Titan adds a splash of upscale style, impressing your clients and friends alike. For extra shininess factor, check out the 2017 Nissan Titan Platinum Reserve. Its chrome trim is guaranteed to catch a few extra eyes as you make your way around town. 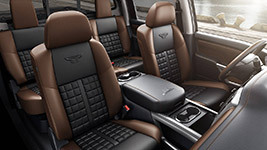 The Platinum Reserve also supplies upscale comfort, fine-tuning your temperature with heated and cooled front seats. This model's power-sliding rear window gives your pickup truck a kind of top-down effect. The Titan's rock-hopping, hill-grinding performance is second to none. 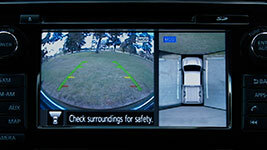 Checking your surroundings for safety has never been so advanced. 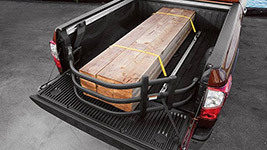 Organize and secure heavy cargo items like the pro that you are. The Titan's generous space and supportive seating supply endless comfort. The 2017 Nissan Titan is a class act. Its unique diesel engine is a true problem-solver, moving the heavy loads that lesser pickups can't touch. 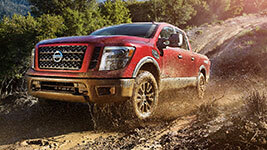 The Titan's off-road capabilities are another major attraction. You'll cruise through rugged territory - whether it's sand, mud, snow, or rocks - like a pro. Tech innovations, like the surround-view camera system, increase day-to-day convenience.